With a reputation nobody can envy, the wind scorpion is an insect spread across most arid places in the world, including Baja California. It is known under several other names: sunscorpion, windspider, sun spider, camel spider, and even deer killer or camel killer. The rumors related to the viciousness of the windscorpion go back to the 2003 Iraq war. These rumors painted the picture of a huge insect that ran faster than humans. It was extremely poisonous, with venom that could knock out a camel. It became infamous for its voracious appetite, able to eat chunks of big animals or even people. The wind scorpion is often referred to as a “spider”, but in fact, it belongs to a different order of animals called solifugae. It does not exceed human speed, though it can run up to 10 mph. It has huge chelicerae (mouthparts) that it uses to rip the prey apart. Luckily, windscorpion prefers termites, beetles, scorpion or any other local insects. It might occasionally eat small snakes, lizards, birds, or rodents, but the menu does never include human flesh or your pet. The most common misconception windscorpion is that it is poisonous. Fortunately, this is not the case, though the insect uses digestive fluids that liquefy the flesh of the prey, like a spider. Know that there is an exception to this rule, but fortunately, this kind of poisonous wind scorpion is located in India. So, this critter might not be easy on the eye, but it does not constitute a threat to human life or to the pets living around your household. However, stay away from those huge chelicerae (mouthparts) because they are able to cause a rather painful bite. 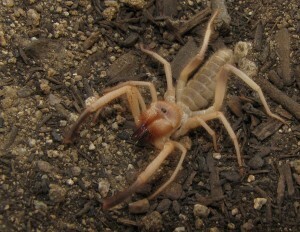 Solifugae are the subject of many legends and exaggerations about their size, speed, behavior, appetite, and lethality. They are not especially large, the biggest having a leg span of about 12 cm (4.7 in). They are fast on land compared to other invertebrates, with their top speed estimated to be 16 km/h (10 mph), close to one-half as fast as the fastest human sprinter. The Solifugae apparently have neither venom glands nor any venom-delivery apparatus such as the fangs of spiders, stings of wasps, or venomous setae of caterpillars (e.g., Lonomia or Acharia species). Copyright 2015© by Baja Good Life Club - All rights reserved. Individual articles may be downloaded for personal use; users are forbidden to reproduce, republish, redistribute, or resell any materials from this Baja Good Life Club Document in either machine-readable form or any other form without permission of Baja Good Life Club or payment of the appropriate royalty for reuse. For permissions and other copyright-related questions, please email your question to: bajagoodlifeclub@gmail.com.